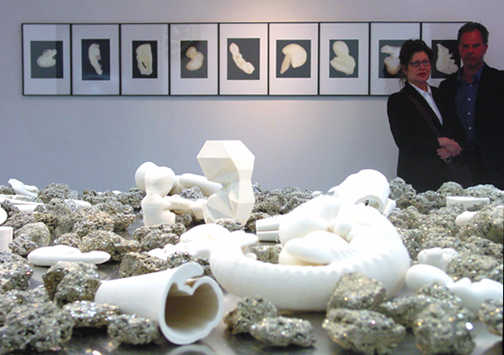 May 13th with a reception and continues through Saturday, June 18th, 2004. Golden Boy is the result of technological imagination taken to full tilt, employing the same digital innovations that produce Hollywood’s special effects, sensitive surgical operations and architectural feats. By turning numbers into form and form into numbers, novel visualizing technologies are impacting the various ways in which we conceive representations of significance in both science and art. In many cultures, the Golden Boy is an archetype of the perfected male child. He is the favorite son. And with new reproductive technologies, prospective parents can increasingly make choices determining the status of their unborn, based on gender. Inevitably female fetuses are being aborted at an astonishing rate in India and China. What are the social consequences of mucking around with life and life forms? Whose imagination will govern? Golden Boy continues and extends Anker’s interest in the intersection of art and genetics. 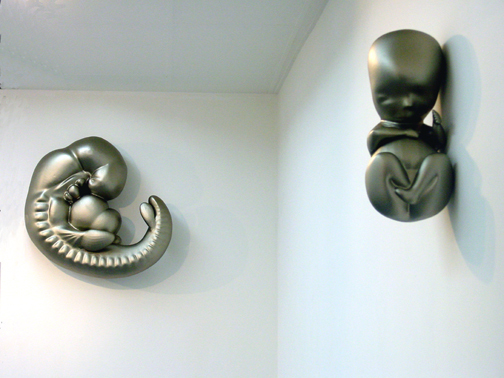 Concurrent with her solo show at UCU, Anker has curated the exhibition Reprotech: Building Better Babies, now at the New York Academy of Sciences, 3 E 63rd. A panel discussion , Art vs ART (the acronym for assisted reproduction) will be held there on June 10 at 6 PM. Her recently published book The Molecular Gaze: Art in the Genetic Age, co-authored with the late Dorothy Nelkin is available at Printed Matter, 535 West 22nd St.